A wall which is a disappointment for some and a nice work for others. Well...I just have to thank certain people who gave me their support and opinions with this one. Also many thx to all people who participated and orginized WAR and let me had a great time. Good Luck @ W.A.R. contest! ^_^ Anyways: Yay! Another new work from Fuku-kun-sama! Oooooo this one's red (I probaly sound ditzy ^_^') So yesh anyways this one's a bit diffrent from the usual, you seem to be slipping to the scene side (still dark though ^_^ ), away from grunge, but notherless it's still beautiful, and dark @_@ but that's what I admire of you! ^_^ Great Job and hopefully I'll see more of your preety style soon! nyaaa.. *pokepoke* thish ish so perfect.. <33 nyaa..
Whoa! This is awesome! I love the colors and the darkness of it is great! It sets the mood. wooooo! you did it again! it look sooooo ncie! i love the fire in the bg! and the building... MMMM...looks tastey! i think the no text version should be the main entry than the text version. one thing cause it is not as good and the text lacks design. but the wall itself is wonderful, everything from the feeling of desolation and the feeling intended to present a morbidness is well done, could use a lot more clouds and gas underneath to present a more disturbed feeling. overall a wonderful wall, i think the no text version should be the main entry for W.A.R. a fav from me, the first fav of an eva wall. you made good. You make me jealous, Fukuu-san >_< i am so so admire your work, they contains a feeling my wall will never get ^_^ They are dark, but cool ! Fav from me! I love it *__* like absolutely love it XD like all your other works ^^ *dances* The color scheme in this waller is awesome I love all the colors and everything! +fav good job! The smoke effect is really cool and the statues in the background fit so well with the mood. And I also like the red sky and those shadows of birds. The scan is also a nice choice. I'm less sure about the house, it seems like a too much clean and new house to fit with the old statue. And I really like more the text less version, I just have the impression that the writing doesn't fit with the atmosphere of the wall. wow, great work, a good mixed of color ><, and the scan iz cute too ^^. I really like everything... hmm.. I dunno how do I explain it, but just that everything looks nice. Kaworu! I must say that the scan is really fitting for the background. And I don't mind the text really, coz the text, to me, at least, fill up the empty spaces on the left side of the wall. The one thing which bugs me a lot is that firery red sky. I don't really like how it looks like. I dunno if you're trying to make it as a smoke or sky, but... that's the only thing which kinda... bugs me. i love it! thr darkish bg is soo cool! nice scan of kaworu! XD like the red sky and clouds! the text gives the feeling of end! :D nice work! +fav! 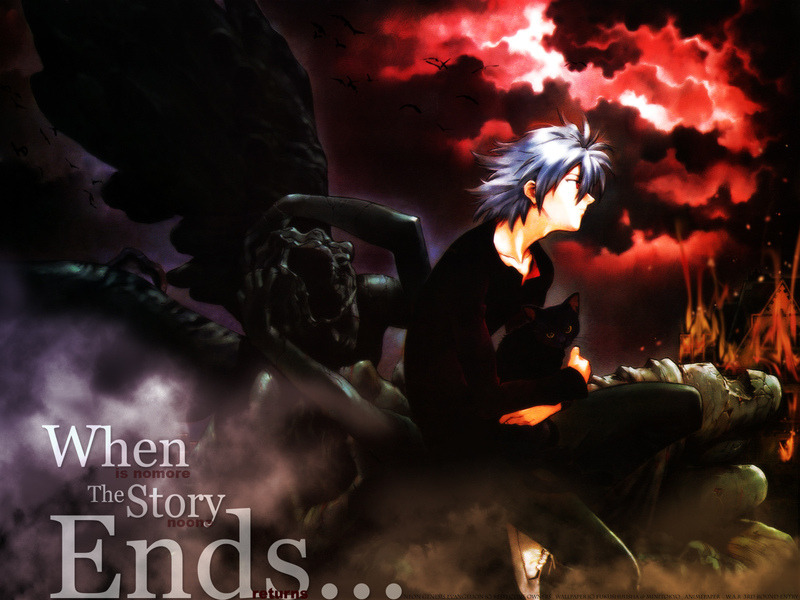 Excellent wallpaper, I have not had too many Kaoru wp's that I have been in interested in but I am downloading this one. anyway i was still impressed with how the wall came out. it really has the theme coming out from the whole setting and bg. i like the burned vivid way the colours look and that noizy graininess. the text maybe be slighlty too prominent but it achieved the effect. it has an "end of the world" atmosphere. but did you mean to misspell "no more" as "nomore"? again, you really created a wallie with a unique concept! Ah ! I like so much this picture ! And the wall is beautiful X3 !